Dar es Salaam is located along the Indian Ocean coastline of Tanzania and is the largest city in the country with around 2.5 million inhabitants. It is a major port city and is the economical and financial heart of the country. Unlike most African cities, book prices here are generally the cover price converted into TSh (rather than a lot more), so it's a good place to stock up on reading matter. National Museum - The national museum mainly shows photos and exhibitions on the development of human nature. A must go to see the skull of the Nutcracker Man (1.75 million years old) and the cast of the even older (3.6 million years) laetoli footprints. Makumbusho Village Museum - All of the houses within the village were constructed in accordance with the types of houses built by various ethnic groups throughout Tanzania. Ngoma dance shows are held from 2:00-6:00pm on certain days. Karimjee Hall - Former parliamentary building. Still in use for seminars. Charity Goat Races - Every September, thousands of people attend the charity Goat Races at The Green in Dar es Salaam. The goats race around a specially designed track, and the races raise around 50 million shillings a year for local schools and charities. Mzalendo Halisi Music Festival - More than 100 traditional Tanzanian music and dance performers participate in this event that takes place at the Posta Grounds in Kijitonyama, Dar es Salaam. During the day, visitors can shop at a culturally-inspired market and view art exhibitions. Fashion Week - Every November, top regional designers come together at Dar Es Salaam's National Museum for Swahili Fashion Week. The event showcases local talent, colorful African styling, and it offers networking opportunities for the East African fashion industry. Contemporary Dance Festival - Choreographers from Tanzania and beyond gather for week-long showcase of contemporary dance sponsored by Visa 2 Dance Company. Audiences can see performances by both established and emerging performing artists. This event facilitates an important forum where international choreographers can showcase their work to a new audience. Event takes place every October. Diwali - Diwali, a Hindu holiday, is celebrated around the world during the months of October or November. Dar es Salaam has a large Indian population, and as a result, Diwali is an important celebration in this city. During the festival, lamps are symbolically lit, and firework demonstrations ignite the sky to symbolize the triumph of good over evil. Downtown Dar becomes consumed by the Diwali festival, with the city center becoming a constant party zone. 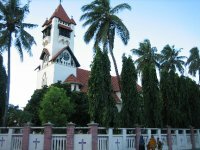 Dar es Salaam has a tropical climate with hot and humid weather year round. Temperatures during the day are around 30 °C, while nights drop to between 19 °C (July to September) and 25 °C (January and February). Rain falls quite evenly throughout the year, but March to May is much wetter, April averaging around 300 mm of rain. Julius Nyerere International Airport (DAR) is the largest airport in the country and located just outside Dar es Salaam. It offers flights to/from Blantyre, Lilongwe, Arusha, Kigoma, Moroni, Mwanza, Tabora, Zanzibar, Entebbe, Juba, Nairobi, Harare, London, Johannesburg, Kilimanjaro International Airport, Addis Ababa, Anjouan, Cairo, Lusaka, Dubai, Amsterdam, Maputo, Pemba, Muscat, Musoma, Shinyanga, Doha, Kigali, Zürich and Istanbul. Centrally located in Zambia, north of the capital Lusaka, Kapiri Mposhi is the starting point of a two nights train ride to Dar es Salaam. From here you can travel further by boat or plane to the tropical island of spices, Zanzibar. This so called TAZARA Railway (Tanzania-Zambia Railway) operates scheduled services twice a week, leaving in both ends of the line on Tuesdays and Fridays around 4:00pm, arriving on Thursdays and Sundays at 9:30am in Zambia, but after noon in the other direction in Dar es Salaam. Bus travel is generally reliable if you pick the right company. It can be somewhat scary as Tanzanians seem to value arriving quickly more than arriving safely ('Mungu akipenda, tutafika' – If God wants it, we shall arrive). Although there are many touts outside of Ubungo's (central bus station) ticket area, they are mostly harmless. If you are put off by them, ask the taxi to take you inside the station for a small extra fee. The ticket offices are located just outside the station, though you can buy the tickets from the bus if you have entered already. This might be a better idea regardless, as you cannot tell the state of the bus from outside, nor how full the bus is (buses will only leave when completely full). Ferries travel to and from Zanzibar. Beware of scams when buying ferry tickets. There is an "official" taxi rate board just outside of the airport arrivals terminal that displays prices roughly twice the "real" prices. If you indicate that you are going to walk the short distance to the main road to hail a taxi from there, then you should be able to secure a more realistic price. The most common form of public transportation in Dar are minibuses which go by the name "daladala". These minibuses go by a specific route with the start and ending point clearly marked on the front of the vehicle. At the main stations (Ubungo, Posta, Mwenge) daladalas from each route do stop to collect passengers at the same stop at the station. It's fine to ask someone were to find the daladala you're looking for, the newspaper/phonecard sellers are often quite helpful. Though not as common as Bajajs, there are many motorcycle taxis, called "bodaboda" ("pikipiki" can also be heard, this just means motorcycle). They are even cheaper than Bajajs, and because of their size they can get you to your destination much quicker during rush hour (which is pretty much all day long in Dar) by zigzagging between cars. You sit behind the driver; it is however not common to hold your hands around the driver, instead you hold on to the luggage rack behind you. Two commuter rail lines (opened in late 2012) run through the city. One line runs 25 kilometres between the Mwakanga and Tazara railway stations. The second runs 20 kilometres between Ubungo-Maziwa and City railway stations. Both lines operate between 5:00am-11:00am and 3:00pm-8:00pm, with no service during the middle of the day. Walking around central Dar es Salaam is a nice way to see the city and probably the best way to get around. In general people will leave you alone except for the occasional greeting. There aren't many sidewalks in Dar es Salaam so exercise caution when walking along busy roads. Cycling around Dar is possible but can be difficult and scary. You should be comfortable with cycling in high-congestion areas where a cyclist is often low in the food chain. Tanzanians have little patience when driving and in their mind any vehicle smaller than theirs is responsible for getting out of the way. Cycling on the Msasani Peninsula is less bad than in more urban areas. Wear a helmet and hone your defensive cycling skills. UWABA, the Dar cyclists' association, is uniting cyclists to lobby for better (or any) bike lanes, traffic safety, and to improve the image of cycling. At the moment cycling is associated with poor people who can't afford motorised transport and middle-class Tanzanians complain that their reputation will suffer if they are seen on a bike. For a countryside cycle trip, the Pugu Hills Nature Centre, 12 kilometres from the international airport (0754 565 498), is a good opportunity, but you need to come with your own bike and make a booking if you plan to visit the place. Due in part to the growth of the expatriate community and the increasing importance of tourism, the number of international restaurants has risen very rapidly over recent years. The city now offers a rich and internationalized diversity of cuisine, ranging from traditional Tanzanian Barbecue style options such as Nyama Choma (Roasted meat – served with rice or ugali) and Mishkaki (Shish kebab – usually barbecued and served with salt, hot peppers, chapati, fries, and rice on the side), and the long-established traditional Indian and Zanzibari cuisine, to options from all corners of the globe including Chinese, Thai, Turkish, Italian, and Japanese food. Restaurants like City Garden, Addis in Dar, and Best Bite are only a few of the most popular restaurants located in Dar es Salaam. Even fast food restaurants like Steers and Subway now have prominent places in the restaurant sector of Dar es Salaam. People who prefer neither fast food or traditional restaurants buy their food from street vendors, who usually sell good food for very affordable prices. Samosas are common street food items within the city. Primary and secondary school students are usually more likely to buy food from street vendors than other age demographics. There is an excellent Chinese, Tai Huo San Zhuang, on Jamhuri St between Morogoro Road and Zanaki Street in the Muslim enclave. It attracts plenty of Chinese customers, which is always a good sign from the point of view of authenticity. It's one of the few places in the area to serve beer. Note that the aircon is cold so take a jumper. Jambo Inn, on Libya Street in the Muslim enclave, has a good selection of vegetarian dishes. It's extremely popular with foreign backpackers. Kilimanjaro, Serengeti, and Safari (the latter being a stronger beer, 5.5% alcohol) are local beers and popular with Tanzanians and foreigners. These are typically 2,300-3,000 shillings apiece for 500ml bottles in local spots, but can cost 4,000 or more at some bars and restaurants. Imported beer available in Dar include Tusker, Ndovu, Stella Artois, Castle Lager, and Heineken. The African imports (Tusker, Ndovu) are not that much more expensive than local beers, but the European beers can be three to four times the price of domestics. Konyagi is a vile-tasting, but popular, local gin, and its variant Konyagi Ice is comparable to hard lemonade and other sweet drinks. Krest, bottled locally by Coca Cola, offer Club Soda, Tonic Water and Bitter Lemon drinks. Stoney Tangawizi (ginger ale but stronger in taste) is one of the more popular soda drinks. Sodas come in glass bottles and you'll usually be asked to return the bottle or pay extra to take it, but they don't usually like that. All of the large hotels have full bars with air conditioning. Many offer 2-for-1 happy hour specials in the late afternoon/early evening. The cost of accommodation can vary from 10000 Tzs a night for very basic rooms to hundreds of dollars for the Holiday Inn Hotel. The YWCA and the YMCA are the main place to stay and meet fellow backpackers. We have a comprehensive list of accommodation in Dar es Salaam searchable right here on Travellerspoint. You can use our map to quickly compare budget, mid-range or top of the range accommodation in Dar es Salaam and areas nearby. This is version 42. Last edited at 13:09 on Feb 22, 18 by Utrecht. 43 articles link to this page.